The Nursery is situated just 4kms west of Armidale NSW on the Northern Tablelands of NSW at an altitude of 1100m. 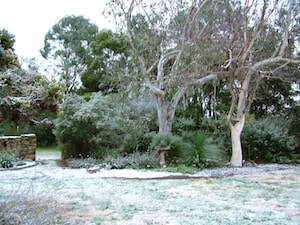 The area experiences hard frosts up to -8C each winter. All plants sold are acclimatised. Seed and cutting material are obtained locally from hardy species. Some tubestock is purchased from Mole Station Nursery west of Tenterfield NSW in order to extend the range. The nursery is owned and managed by Maria Hitchcock OAM. Maria is a garden presenter for ABC Radio New England North West on Saturday mornings at 8.30am. We are open by appointment only. Ring Maria on 0421961007. From the Armidale CBD, Travel to the UNE along Queen Elizabeth Drive and continue west past the UNE colleges. Turn left over the railway crossing then immediately right. You are now on the Old Inverell Rd. Travel along the Old Inverell Rd for 4.2kms then turn right into Hitchcock Lane. We are the first gate on the right. This native garden uses many design principles to counteract frost damage in winter. It has overhead protection with a tree canopy made up of Eucalypts, Acacias and Casuarinas. Plants are grown closely together to provide a variety of microclimates and rock walls near the house provide protection for smaller plants. Plants are carefully placed with aspect in mind. Tender plants are grown on the southern side of the garden or shaded from the early morning sun. New plantings are always protected with a milk carton for the first winter. The garden is covered by a thick layer of woodchip mulch to discourage weed growth and maintain soil moisture. Woodchips were chosen as they last up to 5 years before replacement is needed. This garden is home of the National Correa Collection. Maria Hitchcock OAM is the former Leader of the ASGAP Correa Study Group and is the recognised international expert on Correas. She is currently Leader of the Waratah and Flannel Flower Study Group. Maria also runs an online group called Save our Flora dedicated to rare and endangered native plants. 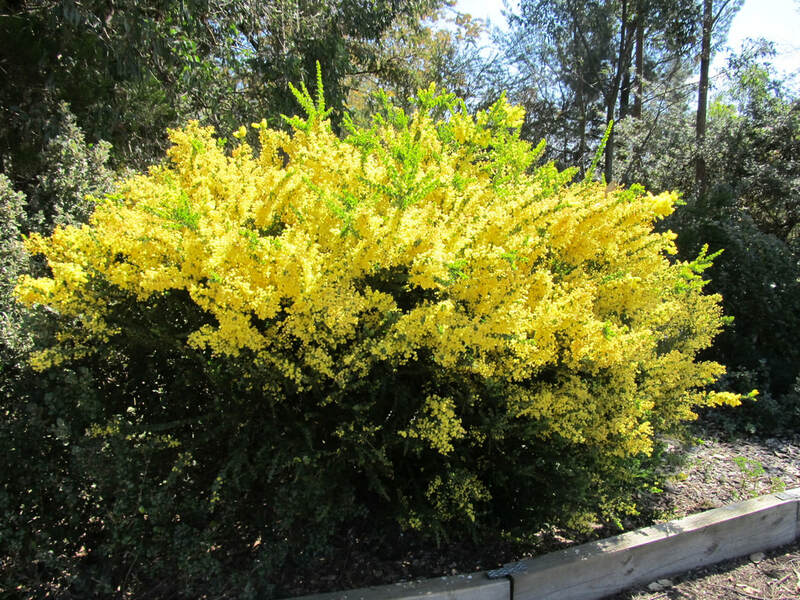 Maria is also known as 'The Wattle Lady' being responsible for gazettal of Australia's National Floral Emblem (Acacia pycnantha) and National Wattle Day (September 1). She has over 40 years experience of growing frost and drought hardy Australian native plants and is a regular speaker at Garden Club events in the Region and at Native Plant conferences. She is author of 'A Celebration of Wattle' (2012), 'Correas - Australian Plants for Waterwise Gardens' (2010), 'Wattle' (1991), co-author of 'Australian Plants for the Northern Tablelands of NSW' (1982) and has written two editions of 'Australian Plants' (Correas and Wattles) as well as many newspaper and journal articles. Maria has travelled extensively throughout Australia on collecting trips and is familiar with the various regions, their climates, soils and vegetation types.